A new update of The Journal 5 has been released. Also, a new add-on, Devotional Prompts 2, is now available. This month we have a FAQ for The Journal 5, a new tip, new writing prompts, and Bernard Armada describes how he uses The Journal 5 on his Mac. AQ: How do I make The Journal 5 look like The Journal 4? 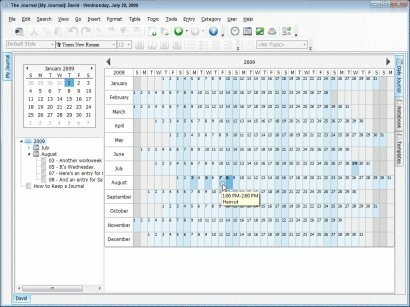 Calendar categories (like “Daily Journal”) can now display your entries in monthly and yearly calendar views. To see the month calendar, click on the name of the month in the entry tree (below the little calendar). To see the year calendar, click on the year in the entry tree. In both calendar views, dates with entries have a slightly darker background and the day number boded. You can see the first line of the entry (or entries) on a date by moving the mouse over that date. Reminders for a date are displayed with their calendar charm and the time, if applicable. You can see the full name and time of the reminder by moving the mouse over the reminder. If you click on a date, you will see a list of all the reminders for that date and summaries of the entry or entries on that date. Entries with photos in them will have those photos reduced to thumbnails. Finally, you can click-and-drag to select multiple, consecutive dates. Journaling Prompt – What type of art or culture moves you–or inspires you–the most? What is it about that type of art that draws you in? 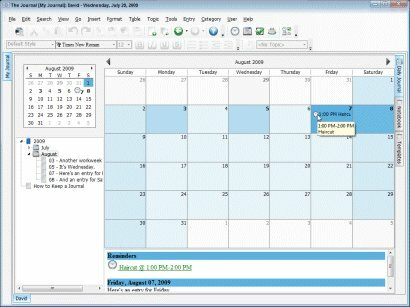 Memoir Prompt – List the computers you’ve owned or worked with (or played with) in your life. Do you remember any of them more vividly (fondly or unfondly) than others? Tell why. Last summer, I succumbed to the seduction of Apple’s latest ad campaign and traded in my PC for a Mac. Although I was excited about exploring all the creative applications offered by Macs that my colleagues had told me about for years, my only fear–honestly–was that I would no longer be able to use The Journal. I’d been using The Journal since the fall of 2007 and had come to rely on it for many of my personal and professional goals. 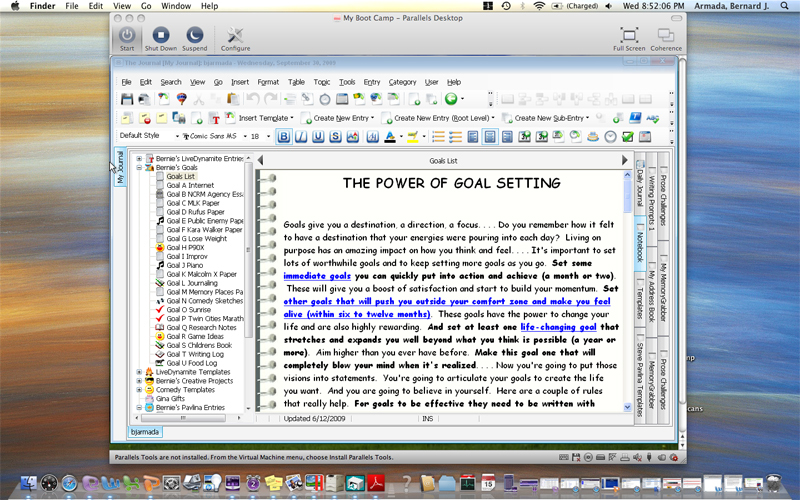 As a college professor, I used the software to plan out writing goals. Each of my writing projects–and the action steps I identified to complete them–were stored in separate folders. I also used The Journal to help identify and achieve many of my personal goals. These included daily logs and action plans for goals to help expand my life in significant ways: losing weight, running a marathon, lifting weights, waking up earlier, logging personal reflections, reducing my Internet use, studying jazz piano, and joining a band. Because some of these goals are ongoing, and because there are many more I’d like to achieve before my time on earth is up, the thought of having to find new Mac-compatible software and perhaps start all over again was not something I wanted to do. I had invested so much energy into The Journal that I simply did not want to go through the hassle of finding a way to transition all my work to a new software program. I think it’s fair to say that, in a relatively short period of time, I became a software developer’s dream customer: I was hooked on The Journal. When I finally did take the plunge into the world of Mac, I tried in earnest to leave The Journal behind. I experimented with trial versions of Mac-friendly journaling software only to find, to my surprise, that The Journal was far more sophisticated and user-friendly than anything I could find on the Mac side. Most of the software I encountered was not much better than using a plain word processor, and the help files paled in comparison to those of The Journal. My despair grew. Then I heard about Parallels Desktop software, which allows users to take full advantage of Mac’s dual processor. Those familiar with Mac products know that users can access the Windows operating system through their Macs by logging into a program called Bootcamp when they startup their computers. Now, I could have accessed The Journal through Bootcamp, but that would also have prevented me from accessing the Mac operating system where all of my other files were stored. Parallels Desktop offers a very easy solution to this problem: for about 80 bucks, Parallels allows users to access both Mac and PC processors at the same time by simply clicking out of one window and into another. I have been using Parallels to access The Journal for over a month without any problems. Once I installed The Journal onto the Windows side of my Mac, accessing the software was as simple as opening up a new window–none of my original formatting was lost. With the exception of having to learn some new key commands (the old Windows shortcuts won’t work), the transition was as seamless as can be. I’m back to using The Journal every day to log my progress on the many plans I have for improving my life, and I’m enjoying the best of both (virtual) worlds.